Each school day I make my kids a fun lunch. I make rice balls and sushi, sandwiches and vegetables, but I never include meat. A couple of years ago, my now 6 year old discovered where meat comes from. He had known beef was from cows, but when he figured out that it wasn’t a “donation”, he swore he would never eat meat again. And he was serious. Joe has not eaten meat in years, be does love eggs. If I hard boil a dozen eggs, I have to watch to be sure he doesn’t eat all of them in one sitting. Assuming that I can stop the eggs from disappearing as soon as I make them, I like to send them for school lunch. They add a little substance to our vegetarian lunches. And it’s easy to make eggs “fun”! 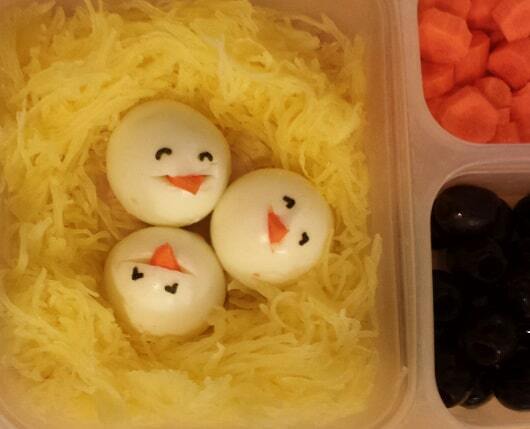 For this chicks in a nest lunch, I sliced the eggs in half and added nori eyes and a carrot beak. The nest was made with spaghetti squash. Go HERE for more details on how to make it! 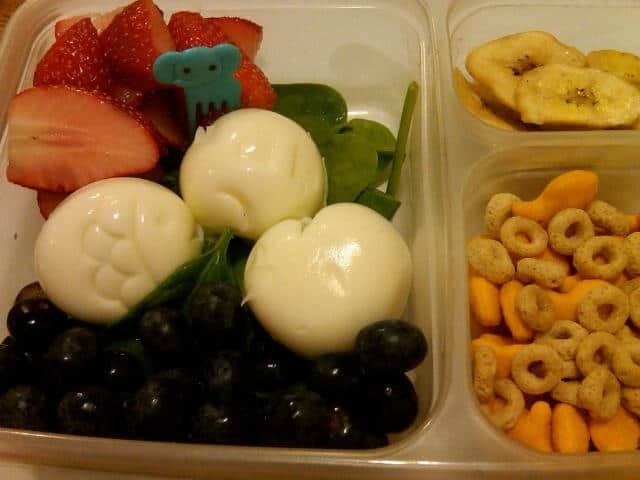 Making hard boiled eggs into fun shapes is easy if you use an egg mold while the egg is still warm. Go HERE for details on how to do it. 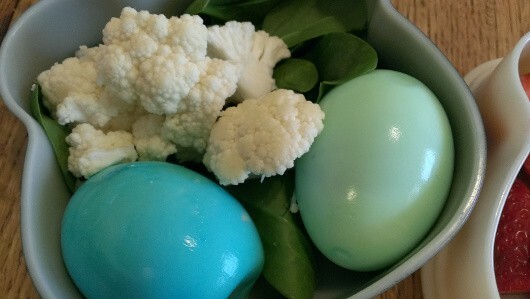 I usually throw the fun shaped eggs on a salad or with some sliced vegetables. They could also be an addition to a sandwich or rice ball. When I’m out of ideas but in need of a fun lunch, I make shell-less Easter eggs. Once the eggs are peeled, I drop them into a cup with water and food coloring. In a few minutes, I have colored eggs. For more details, go HERE. I’m certain there are more easy ways to send eggs in the lunch box, I just need to figure out what they are. If you have ideas, please tell me!